-	How are nationalistic agendas advanced by and through animals’ role in the cultural politics of nation building or destruction? -	How are nationalist discourses, imbued with racial politics, also a project of rendering animal or subhuman those who fall outside of and beyond a particular formulation of human (see Wynter’s  formulation of Man 1/2; also McKittrick 2014; Weheliye)? 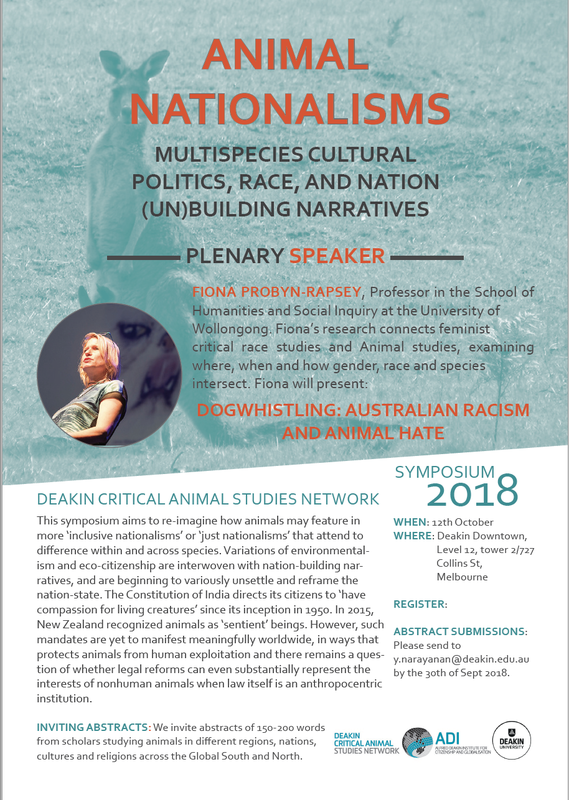 -	How is legislative action framed around the cultural use of animals in nation/identity-building by animal advocacy, as well as nationalist groups? -	How can/has the burgeoning animal advocacy movement worldwide responded to the cultural uses of animals in nation-building projects, through legislation or advocacy? -	How does international trade, international political coalitions, increased militarisation, and the resurgence of right-wing extremism and local parochialisms globally impact cultural practices and uses of animals of particular states or regions?